BUCK, Charles Francis, a Representative from Louisiana; born in Durrheim, Grand Duchy of Baden, Germany, November 5, 1841; immigrated to the United States in 1852 with his parents, who settled in New Orleans, La. ; was graduated from the high school of New Orleans in 1861; attended Louisiana State Seminary and Military Academy at Alexandria; studied law; was admitted to the bar in 1867 and commenced practice in New Orleans, La. 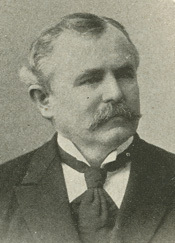 ; member of the school board of New Orleans for many years; city attorney of New Orleans 1880-1884; elected as a Democrat to the Fifty-fourth Congress (March 4, 1895-March 3, 1897); declined to be a candidate for reelection in 1896; resumed the practice of law; unsuccessful candidate for mayor of New Orleans in 1896 and again 1904; member of the supreme court board of examiners for admission to the bar 1898-1900; died in New Orleans, La., January 19, 1918; interment in the Metairie Cemetery.